You've just seen a sample of my paintings. I invite you to email, call me, or fill out the form below if you are interested in seeing more of my work or are interested in purchasing an original painting or a giclee. Your surroundings make a huge difference in how you feel; so treat yourself to something nice knowing it really is an investment in yourself! I do commissions, and maybe you'd like me to create that “special” original piece just for you in pastel, watercolor, or acrylic on canvas. Send email art@brendaboles.com or use the form below. This form is for your convenience. Not all of the fields are *required. 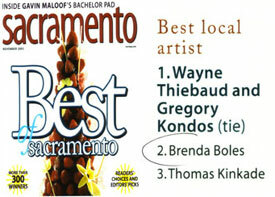 "voted by the readers of Sacramento Magazine Nov. 2003"